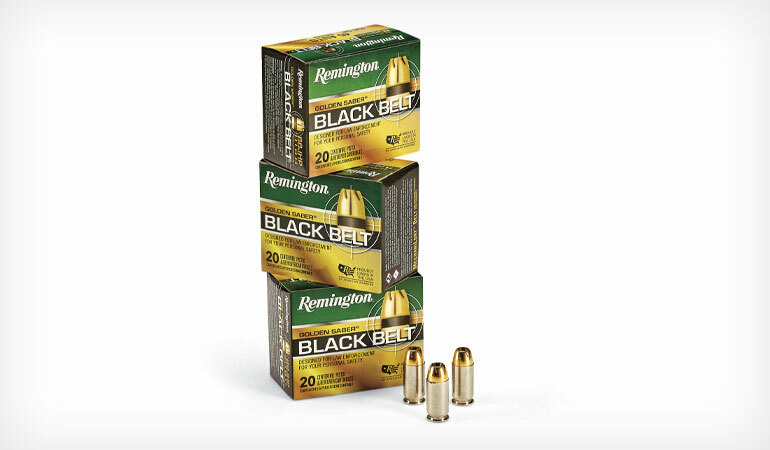 Remington designed its Black Belt line of handgun ammunition to be “the pinnacle of stopping power.” Engineered in conjunction with law enforcement professionals, the Black Belt ammunition was initially available only to law enforcement, but now it’s being offered to civilians. It’s available in 9mm, .40 S&W, and .45 ACP in 20-round boxes. I’ve been shooting the .45 ACP loading. The Black Belt ammunition gets its name from the Golden Saber bullet that’s been modified with a black belt in the middle. The hourglass shape of the bullet allows the Mechani-Lokt black belt, which is made of black nickel-plated brass, to lock the bullet’s brass jacket and lead core together, thereby controlling expansion and providing optimal terminal performance. 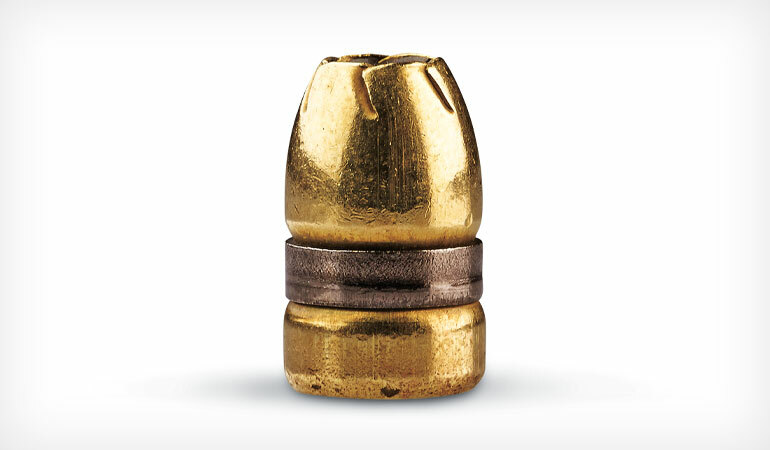 The hollowpoint bullet also features a driving band at the base and spiral cuts at the nose. The company says the Black Belt Golden Saber bullet provides massive, reliable expansion and consistent penetration. The ammunition is loaded in corrosion-resistant nickel-plated cases and uses flash-suppressed propellant to minimize muzzle flash. It has waterproof seals at the neck and at the primer pocket, and the primer is optimized for consistent ignition. The ammo I’ve been working with has a 230-grain bullet. Rated velocity is 875 fps in a 5.0-inch barrel. My chronographing of the ammo with a Competition Electronics ProChrono chronograph indicated the velocity ranged from 768 fps in a 3.5-inch barrel to 777 fps in a 4.25-inch barrel to 811 fps in a 5.0-inch barrel. Extreme spreads and standard deviations were in the mid double digits, indicating the ammo is consistent. Energy figures based on my chronograph results ranged from 301 ft-lbs to 336 ft-lbs. As for accuracy, the accompanying chart has the details. 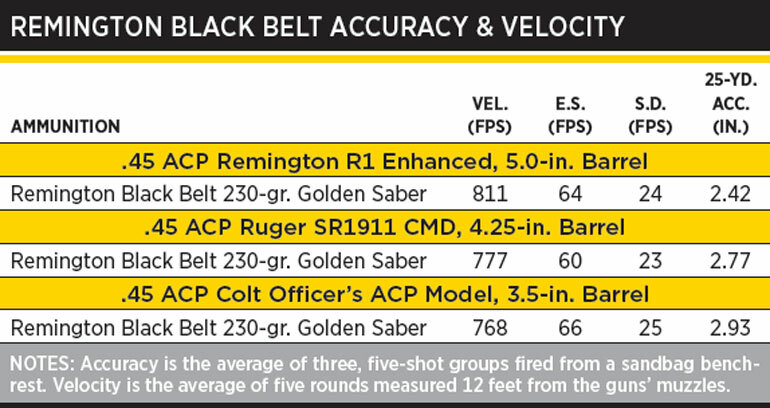 The new Black Belt .45 ACP ammo performed well, definitely within the self-defense standard of 4.25 inches at 25 yards.